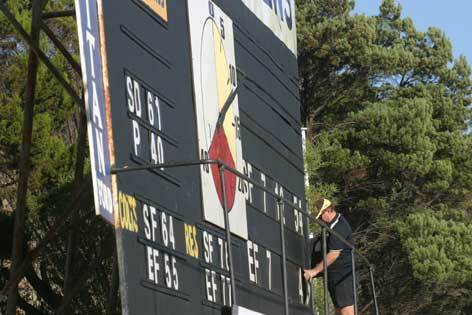 After South Fremantle defeated East Fremantle in the 1997 WAFL grand final at Subiaco Oval, Steve McCarthy added to the celebrations back at Fremantle Oval by bolting the score onto the scoreboard. It turned out to be a very good idea. Steve has been working the scoreboard for the Bulldogs “on and off” for 14 years. He’s been doing the job regularly in recent years after a spate of mistakes by the kids and others who did the job. “There was a pre-season game that South Fremantle won by a point but the scoreboard showed a draw,” Steve said, “Cicco (SFFC general manager Brian Ciccotosto) begged me to do the board. Scores from other grounds are cause for concern for Steve who always tunes in with a trusty old transistor. “I’m not lazy, I’m pretty quick. THEY first played footy at Fremantle Oval in 1895 when, after a couple of years of negotiations, the Fremantle Football Club got the go ahead to use the area then known as Barracks Field. Fremantle shared the ground with Imperials who dropped out of the competition and were replaced in 1898 by East Fremantle. Fremantle folded in 1899 and South Fremantle were formed in 1900. East and South shared Fremantle Oval until East moved to East Fremantle Oval in 1953, something they also did in 1906 but that move only lasted a year. East Fremantle’s most famous team won 35 consecutive games, including two grand finals from half way through the 1945 season to round four 1947. The undefeated premiership team of 1946 was coached by Jerry Dolan, captained by Charlie Doig and included Jack Sheedy, Jim Conway and Allan Ebbs. South’s golden era began with the 1947 premiership and included flags in 1948, 1950, 1952 and 1953. Ross Hutchinson coached the first two premierships and Clive Lewington the next three. The stars of the team were Steve Marsh, Charlie Tyson, Frank Treasure and Bernie Naylor. Now South Fremantle shares the ground with the Fremantle Dockers. 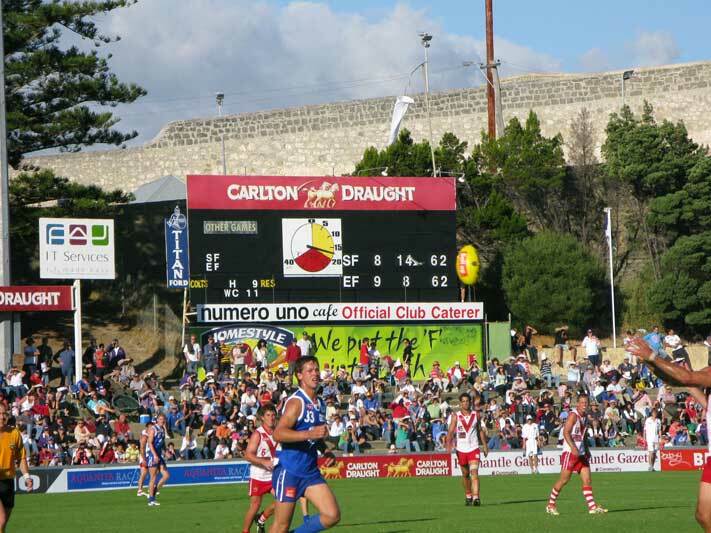 The photo was taken during the first Fremantle Derby of 2009 with scores level in the last quarter. South went on to win by six points. Behind the scoreboard is the convict-built wall of the Fremantle Prison. Does Steve wear a yellow Burley costume when he’s doing the scoreboard or is that just a well timed (as well as very diplomatic) bit of photography? Good observation Shane. It was a Burley costume.